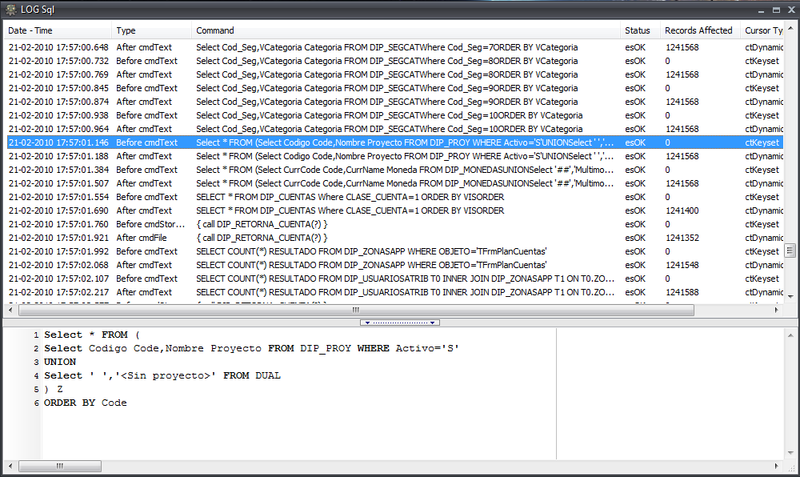 You can construct your own SQL profiler for yours apps wich use ADO, the TAdoConnection Object has two events TADOConnection.OnWillExecute and TADOConnection.OnExecuteComplete to accomplish this task. 4) Assign the events OnWillExecute and OnExecuteComplete for you AdoConnection object. I am doing some tests on two small applications that I am developing. ¿Pues colocar el código del proyecto? Can you upload the project source code? This is a quite tricky idea! Thanks for it. I noticed in my app, which retrievs its data from a MS SQL Server (2000) that parameters in SQL commands are shown as question marks. Is there a way to show them in a more informative way? Thanks Rdrigo for your answer! The SQL statement shown whith question marks instead of the paranmters is not verry helpful for me. And I don’t know any way to get that signs replaced by the actual parameters or their values. Edelklaus, I showed you how to obtain the values of the params, not display them, you must process the data and show it. Hi Rodrigo, I think there is a problem with Command.Parameters. Everytime I try to obtain the values in a Query with Parameters I get an Access Violation. I have the same problems if I use RecordSet to obtain the data. I never get a Showmessage (even when the compiler enter in the for). Could it be possible to view UPDATE and DELETE statements with this profiler? if not, do you know any other way to achive that. Thanks, nice tool!. Yes, you can see any statement. hey rodrigo, i have a question about your code, the first lines that presents at the beginning of the article should be added in the application?, because my app doesnt works like yours did i’m missing something? No, these lines only shows the definition of the TWillExecuteEvent and TExecuteCompleteEvent Events. you don’t need add these lines to the project. Yes the events TADOConnection.OnWillExecute and TADOConnection.OnExecuteComplete only report event to the attached ado connection. In fact, you may have made 1000 updates but the TExecuteCompleteEvent doesn’t fire once. Any idea to get around this? I’d like to know if it is possible to also log an update like ‘Walt’ has asked above.